CHICAGO — Year-over-year coin laundry sales in the South were up 10.6% on average last month, the highest among all regions, according to results of this month’s American Coin-Op StatShot survey. Store owners in the West also reported strong November year-over-year sales, up 9.3% on average. In the Northeast, year-over-year coin laundry sales were reported to be up 6.9%. 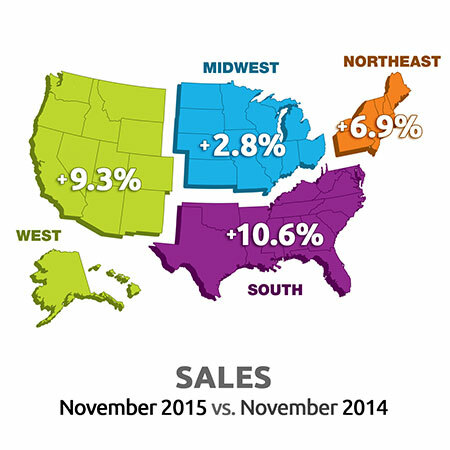 The Midwest region also saw better comparative sales in November, up 2.8%. November was the ninth straight month that sales in all four regions have been higher (or, in the case of one region in June, unchanged) when compared to the same month the prior year. The South region posted the lowest average available wash price for a front loader among all regions in November at $2.20. Lowest individual store prices there ranged from $1 to $3.50. The majority of operators there (77%) say these prices are unchanged from the same time last year, while the remainder say the prices are higher. The average highest available wash price for a front loader in November in the South was $7.70, with highest individual store prices ranging from $4.50 to $11. The majority of operators (58.3%) say these prices are higher than they were last year; the remainder say these are unchanged. The average lowest available wash price for a front loader in the West last month was $2.40, with lowest individual store prices there ranging from $1.99 to $3.25. Roughly 67% of operators there say these prices are unchanged from the same point last year, while the remaining one-third say these prices are higher. The average highest available wash price for a front loader in the West last month was $6.50, with highest individual store prices ranging from $5.50 to $9. The majority (66.7%) of operators in the region say these prices are unchanged from the same time last year, while the remainder say these prices are higher. Average lowest available wash price for a front loader in the Midwest in November was $2.50, with lowest individual store prices ranging from $1.75 to $4. The vast majority (91.7%) say these prices are unchanged, while the remainder say they are higher than the same time last year. The average highest available wash price for a front loader in the Midwest last month was $7, with highest individual store prices ranging from $2.50 to $11. Just 16.7% of respondents say these prices are higher than the same time last year. The remainder say they are unchanged. Average lowest available wash price for a front loader in the Northeast was $2.60 last month, with lowest individual store prices ranging from $1.75 to $3.25. Roughly 86% of respondents there say these prices are unchanged from the same time last year, while the remaining 14.2% say the prices are higher. The average highest available wash price for a front loader in the Northeast last month was $7. Highest individual store prices there ranged from $4 to $9.25, with 71.4% of respondents saying these prices are unchanged from the same time last year. The remainder say these prices are higher. The unscientific StatShot survey includes information on sales, wages, costs or other financial data based on survey information provided anonymously by vended laundry store owners. American Coin-Op audience members are invited via e-mail to participate in the surveys, which are conducted online via a partner website.